← ‘Expert Consensus Reports’ are scientific mumbo jumbo! What is Our Government . . . Really? WHILE EVIDENCE THAT THE ‘GOVERNMENT’ IS JUST A COMMERCIAL ENTERPRISE IS EVERYWHERE, WE HAVE BEEN ‘CONDITIONED’ NOT TO SEE IT! Did you know that 98% of the Law Schools in America and England do not include Constitutional Law as a part of their law curriculum? 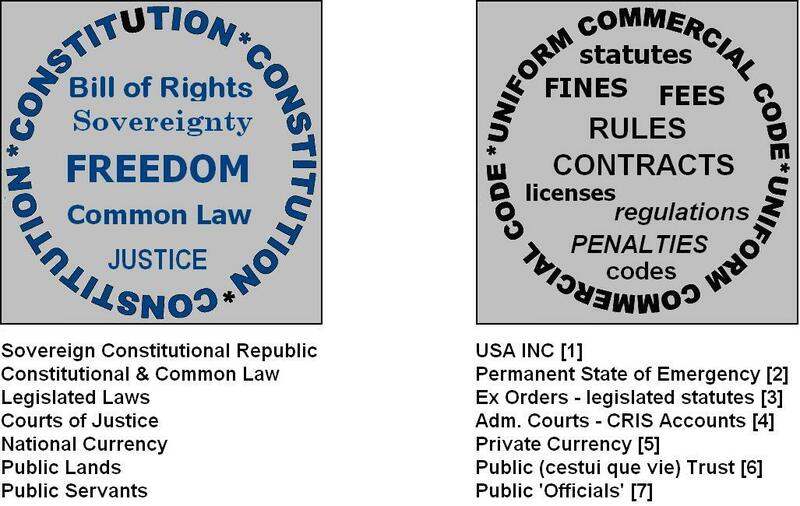 The reason for this phenomenon is because Constitutional Law does not apply to or affect the enforcement of statutes, codes or administrative regulations, which have replaced constitutional law, the common law, public law and penal law and which have been designed to control you. The Federal and State Governments are not real. They are privately owned corporations [listed on Dun and Bradstreet] called governments. . . and the law is nothing more than their corporate regulations called statutes. Everything they have been doing is one gigantic fraud and all of it at our expense! ‘We the People’ have been deliberately deceived! To find solutions to the problems that face us all, we need to discover what our so-called government ‘really is’ and how it ‘really works’. What we have been taught in school and on the media is the “deviant creation” of the global elite, who have used their ability to create and control money to deceive and enslave the American people. Experience has proven that the simplest method of securing a silent weapon and gaining control of the public is to keep the public undisciplined and ignorant of the basic system [by] . . . The corporate governments and their courts, only have jurisdiction over corporations. Corporations have no rights or jurisdiction over living people and are only provided considerations, which have been pre-negotiated in contracts by their directors. Otherwise, they’re governed totally by commercial law, and so are you! This entry was posted in corporation, Government and tagged bill of rights, clearfield doctrine, constitution, statutes, uniform commercial code. Bookmark the permalink. All governments at any level, in any country is a business. Have any of you noticed the endless menu list of fees for various services, and fines or charges for non compliance to any regulations? They remind me of walking into a bank where there is probably a fee to greet customers. Governments are like living under the rule of The Republics of McDonald’s, Yahoo, Walmart, Toyota, Chevron, Amazon, Ebay, Paypal, IBM, Xerox, Staples, Asus, Casio, Disney, AOL-Time Warner, etc.